Developing carpal tunnel syndrome is a serious problem for piano players. The weakness, numbness, and tingling in the hands caused by carpal tunnel syndrome – not to mention the pain! – can severely limit time spent making music on the piano. It’s best to prevent carpal tunnel syndrome entirely, but if you have symptoms of the syndrome already, do not despair! There are many things you can do to lessen or even eradicate the pain. Carpal tunnel syndrome is the compression of the median nerve as it passes into the hand. 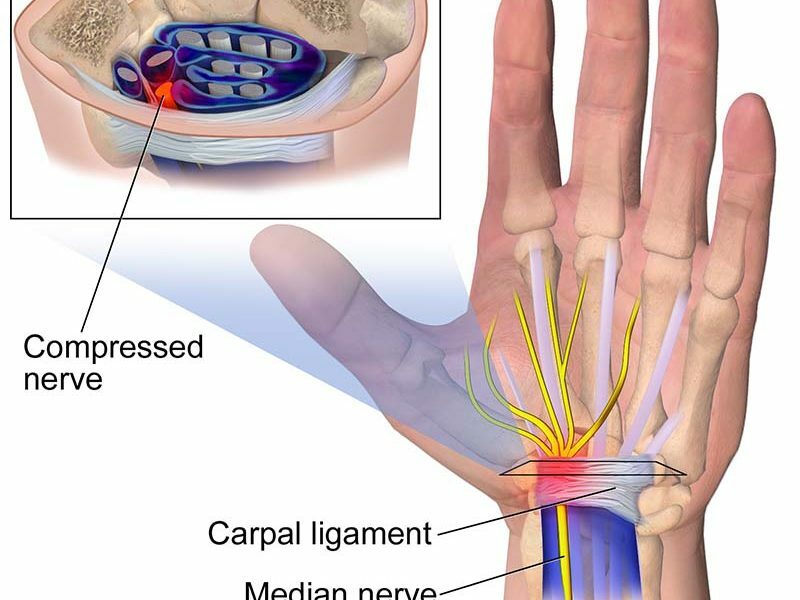 The pain in the carpal tunnel is due to excess pressure in your wrist and on the median nerve. Inflammation can cause swelling. The main causes of carpal tunnel syndrome are underlying medical conditions and repetitive movement. Click Here for some great basic information on carpal tunnel syndrome. Most people who play the piano do so for pleasure; it’s not their job. And many people who play the piano also have jobs that put a great deal of pressure on the wrists. Office workers, welders, gardeners, mechanics, hairdressers – the list goes on and on! Any job that requires you to make repetitive hand motions, uses awkward hand positions, or strong gripping puts one in danger of developing carpal tunnel syndrome. If you have taken even one piano lesson, chances are your teacher talked to you about posture, wrist position, and the correct way to use your body when playing the piano. These tips are not to make your life more difficult, instead, they are intended to make playing easier and to prevent injury. 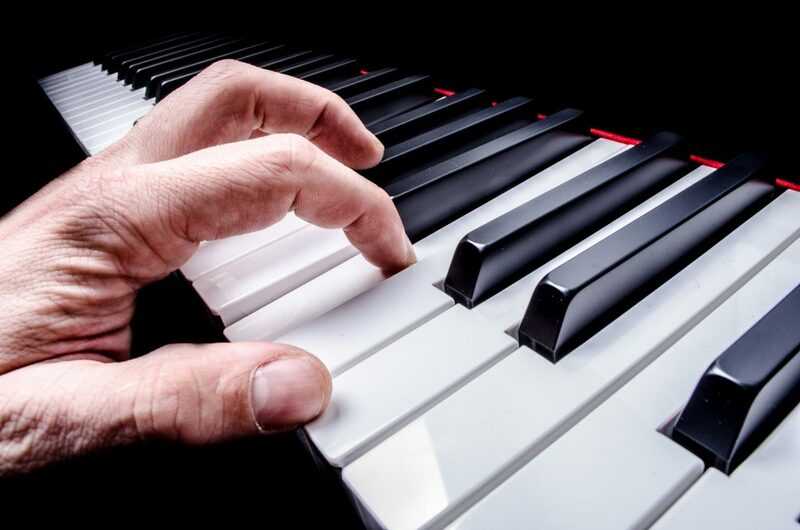 The ideal wrist position to prevent pain and carpal tunnel syndrome is a neutral or straight wrist – the same wrist position for playing the piano! But, we are only human and sometimes it’s easy to slip into bad habits. Think about how difficult it is to remember to maintain perfect posture and wrist position while playing the piano. Now imagine that you had to remind yourself to maintain that ideal position at work all day. It’s basically impossible. That’s why you see so many cashiers and office workers wearing wrist supports. A good wrist support will keep your wrists in a straight position while performing repetitive tasks. Many people with wrist pain will even wear wrist supports when sleeping in order to keep their wrists straight throughout the night. If you have a job which requires you to do repetitive movements with your wrists, you may want to consider purchasing wrist supports. Click Here for a brand that we have found useful. So how should one sit at the piano to prevent injury to your wrists and other parts of your body? Rest your feet completely on the floor. Feet don’t reach the floor? Use a stool. Be aware of bench height – is it too low or high for you to comfortably play? Are you able to keep your elbows and wrists in line while playing? Talk to your teacher about how to sit at the piano or drop by Piano Emporium! We are happy to demonstrate and help you find the ideal playing position. Note: It is important to see a doctor to rule out if you have a medical condition that is causing the pain. It doesn’t matter how many wrist strengthening exercises or stretches you do if the pain in your carpal tunnel is caused by diabetes, high blood pressure, etc. Work with your doctor to be sure of the root cause. 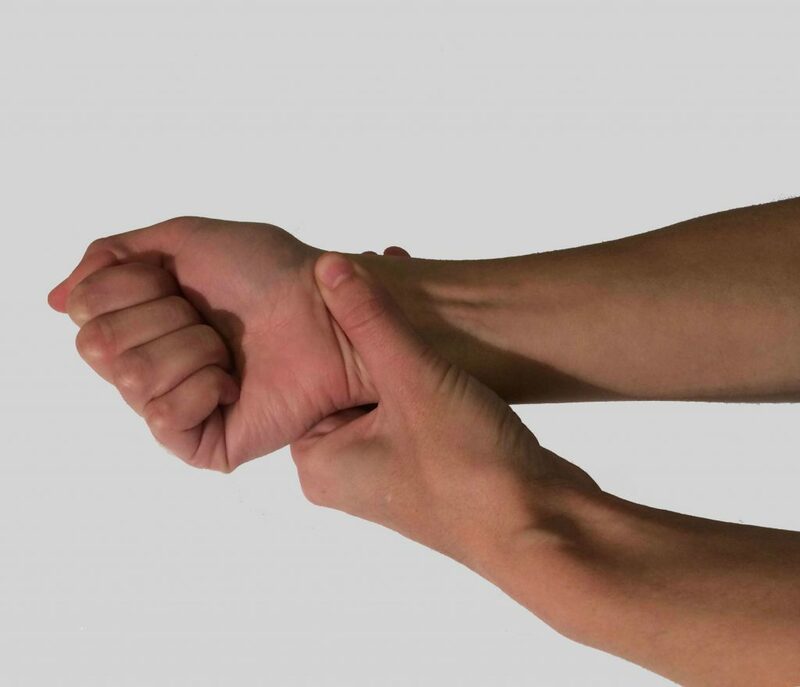 The good news – wrist stretches and exercises are not difficult. You will not break a sweat or get out of breath. And there are so many great articles and videos online that demonstrate helpful exercises. WebMD has an article with good basic stretches. The key is to not overwork your wrists. Be gentle. In the case of already inflamed wrists, less is more. Ice your wrists. As with all inflammation, ice helps! BUT don’t play the piano with cold hands and wrists. If your hands are cold you may want to wear gloves for a few minutes before playing, or even invest in a pair of fingerless gloves that you can wear while playing if you have chronically cold hands. Raise your hands above your head throughout the day. This can help to reduce accumulated fluid in your hands and decrease pressure on the median nerve. Take breaks when playing the piano. Stretch. Get up and walk around. If your wrist pain is bad, then it is probably best to stop practicing until the pain abates. This is one of the only times we will advise you to stop practicing! Sometimes, our bodies need a little break so that we can come back to the piano refreshed and ready to play again.